We got the tour of the boat from Cristina, our Italian dive instructor, and our other dive guide, a local guy named Nelwan. Because of weird weather for the season the news was that the South of Komodo was bad viz while the North was good, which may be due to El Nino. 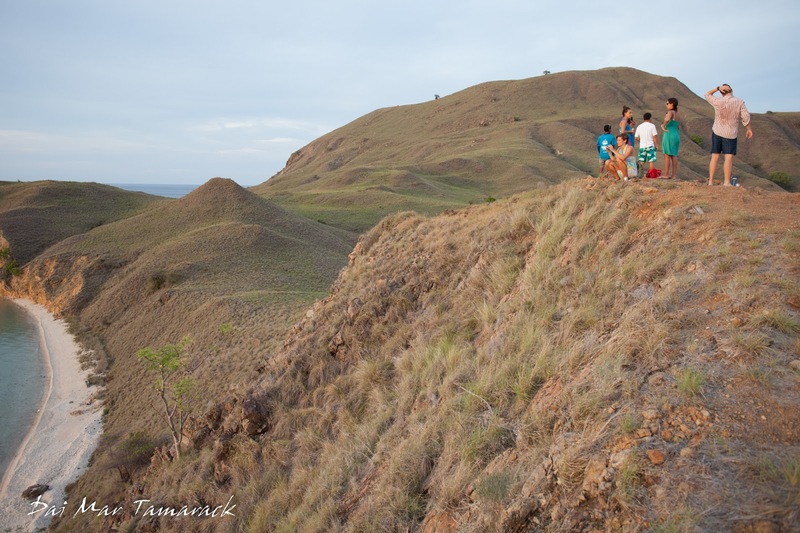 Since this is contrary to what normally occurs at this time, we decided to change the itinerary and head towards North Komodo. 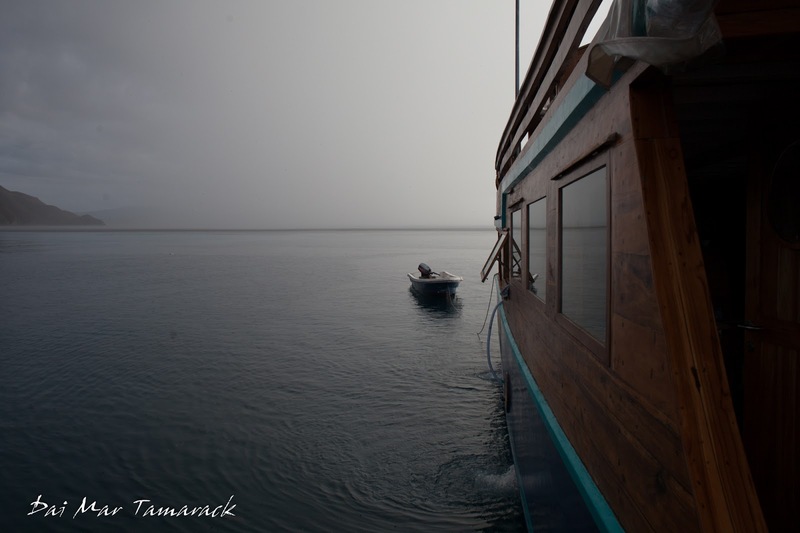 The decision proved best when we arrived at our first dive site on an island just North of Kanawa, where we stayed last time. We were met with clear, blue water. We did two dives in the area then found a fun little cove to anchor the night for. Before sunset we jumped on one of the small boats and took a short hike up on top of a hill of a small uninhabited island to a great sunset overlook. Kristina busted out some beer and we all soaked up the changing colors. 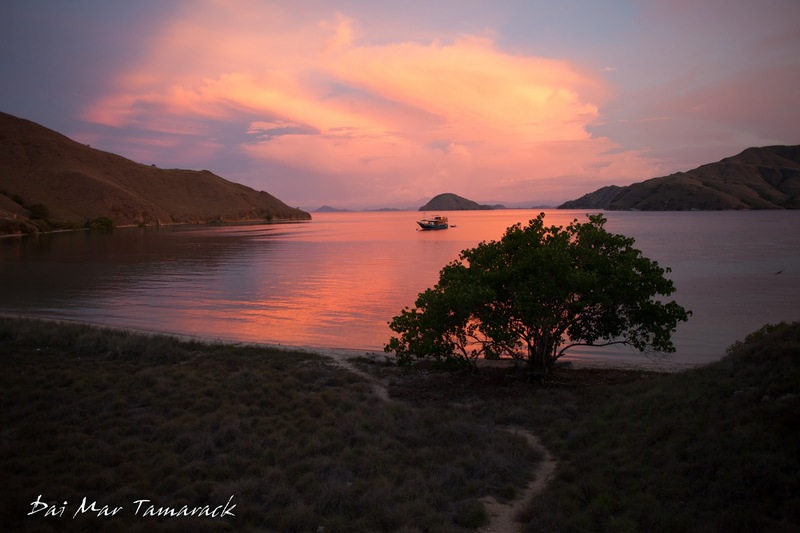 When it comes to sunset in Komodo, they only have the best, and this one was par for the course. A great first day on the liveaboard. 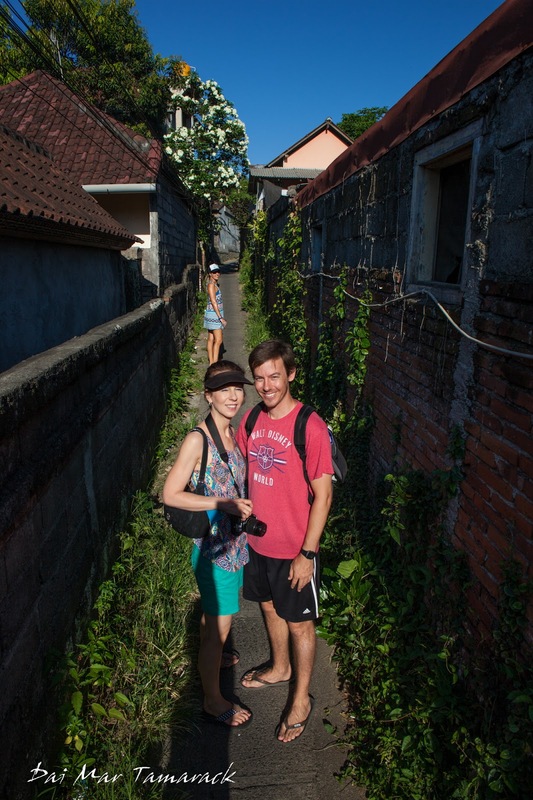 While this entire trip to Indonesia has been an adventure, the time has come for the adventure within the adventure. 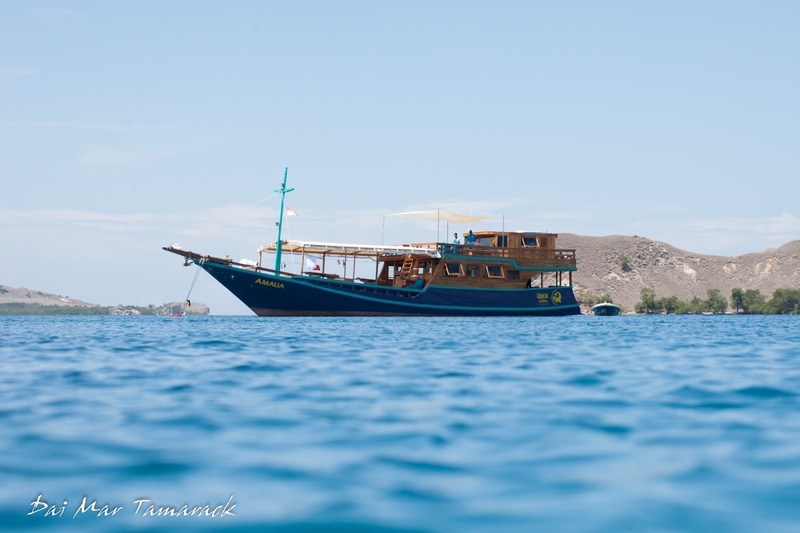 Heidi and I are all booked on a 5night/6day boutique scuba liveaboard. 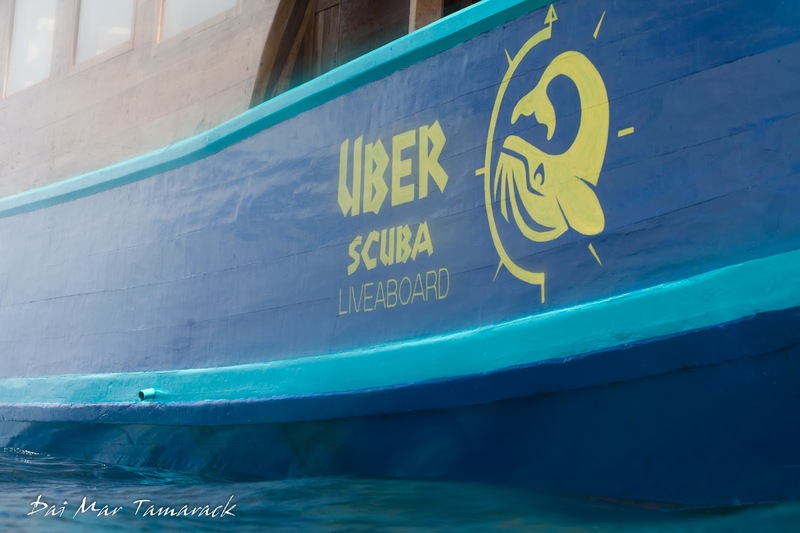 We will be sailing on the newly built Amelia, with Uber Scuba out of Labuan Bajo. 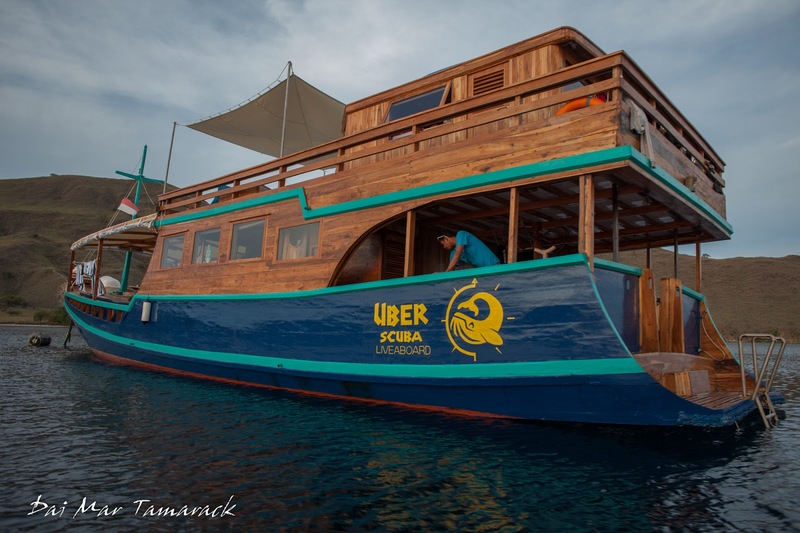 I have only done one other scuba liveboard trip which was on a very modern looking motor yatch out of Cairns to dive the Great Barrier Reef. You can read about that here. 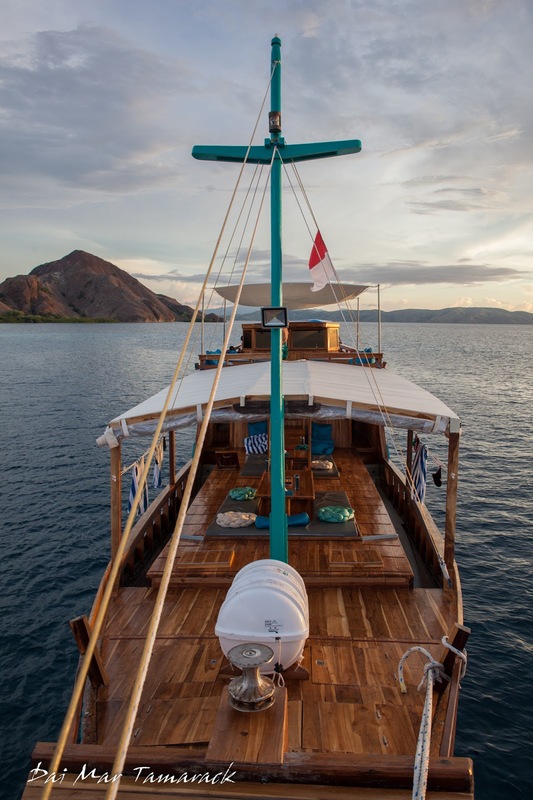 I was excited to see the Amalia and find out what diving and living was going to be like here in Komodo. We could immediately see the care that went into building Amalia with beautiful wood finish everywhere. 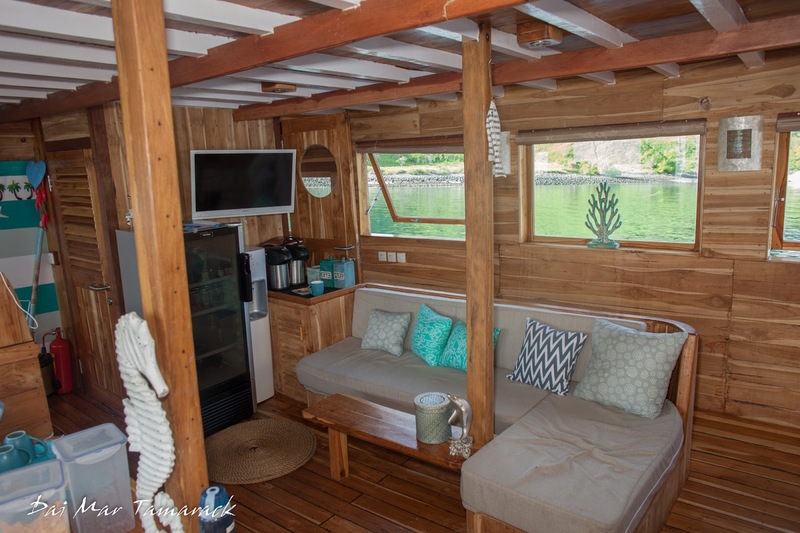 The back deck where we first stepped on board was all set up for diving. Each person had their own area with name written above, and box below for dive computers, watches, etc. There was also a very ingenious system built into the dive deck allowing the crew to fill the tanks right where they were, which saved space, time, and energy....all valuable things on a boat. 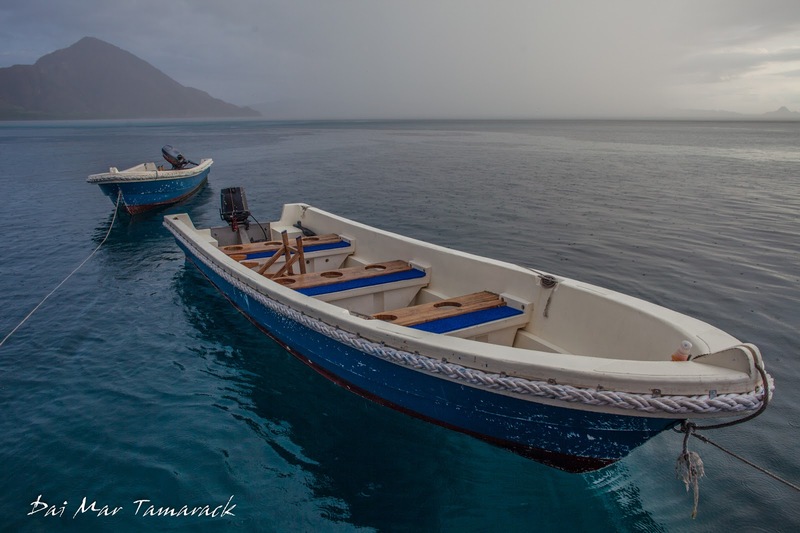 Two small speedboats were towed behind Amalia which were also set up for holding tanks and divers and transporting them to and from dive spots. 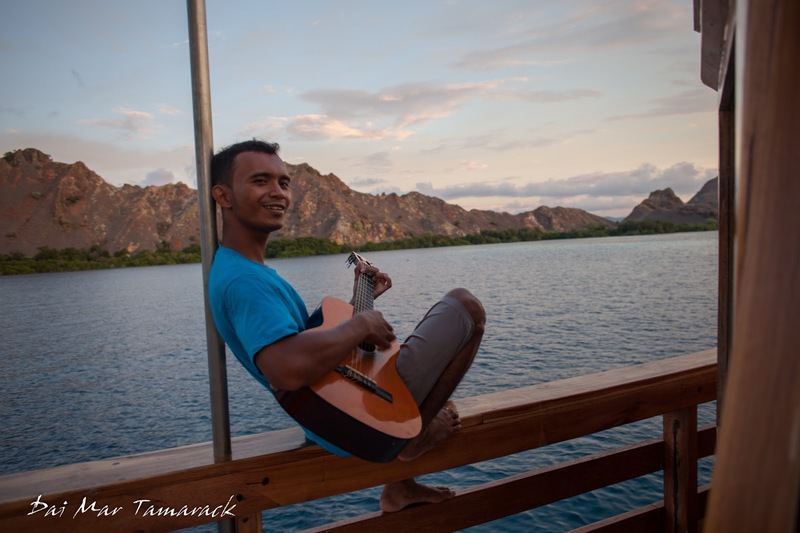 The crew was mostly local Indonesians, from the cooks to the captain and small boat drivers, as well as the head dive guide, Nelwan. 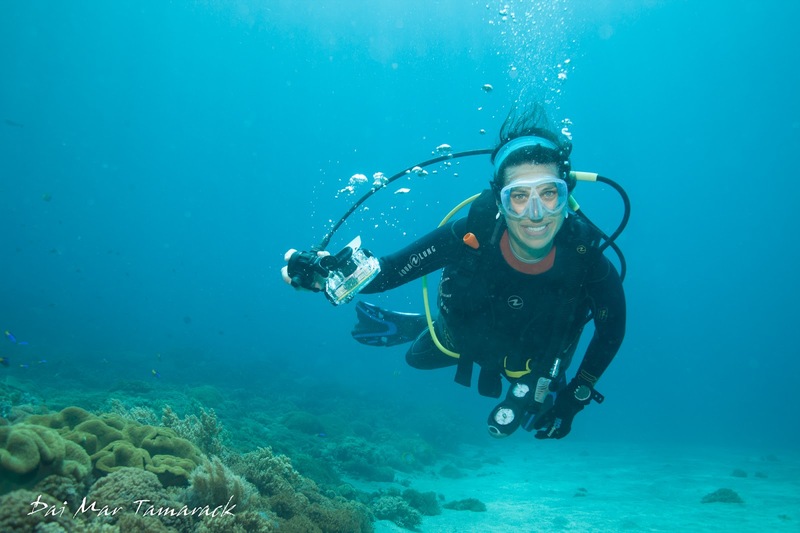 Cristina, who is part owner, also came along as the dive instructor for the trip. 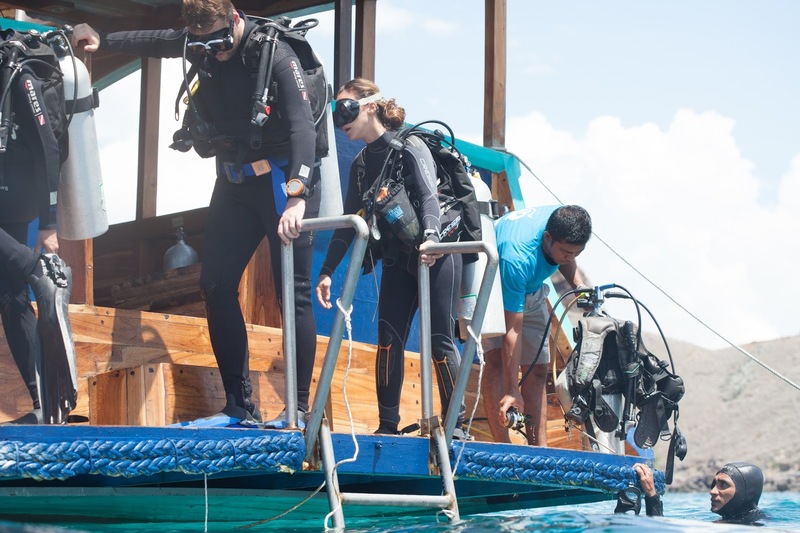 Heidi took advantage of this by getting her Advanced Scuba Certification on the trip. I was very much looking forward to trying some of chef Arnold's hearty meals. 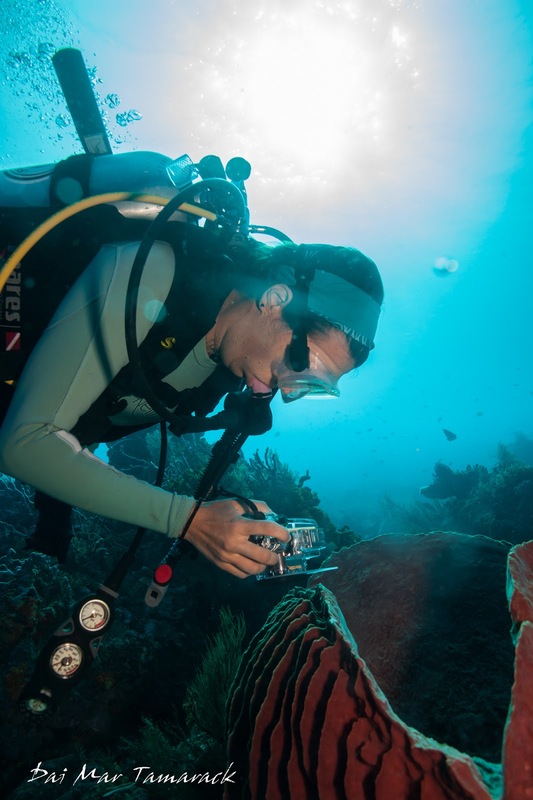 There is something about doing a lot of scuba diving that gives you a pretty huge appetite. 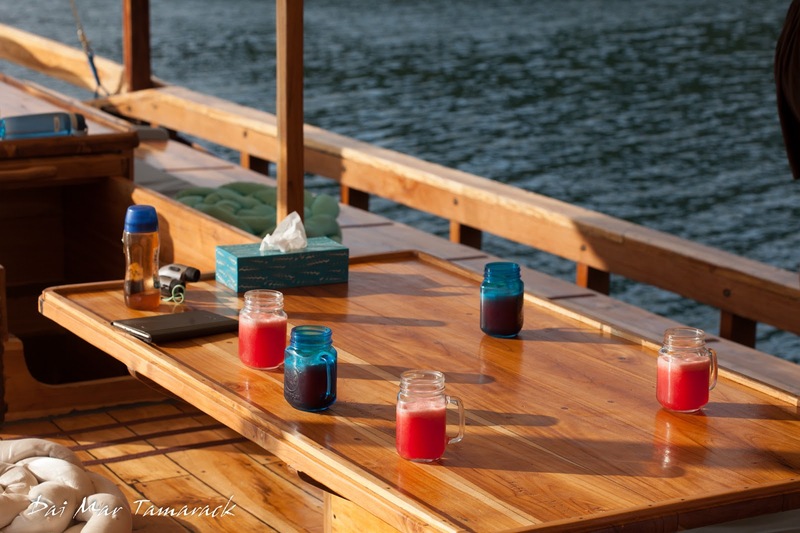 There was a nice lounge area inside, and a large covered deck up front where our tables and cushions were located. Down below were the rooms, which were cozy, and nautical themed, with a very nice bathroom for a boat. I know how cramped quarters can be on a boat so I was pretty pleased with our queen bed, en-suite bathroom, and two portholes that opened. Bean bag chair and cushions for laying out on the upper sun deck made warming up from dives much easier. Although most of the dive sites we visited had water in the mid 80's so not much warming up was necessary. 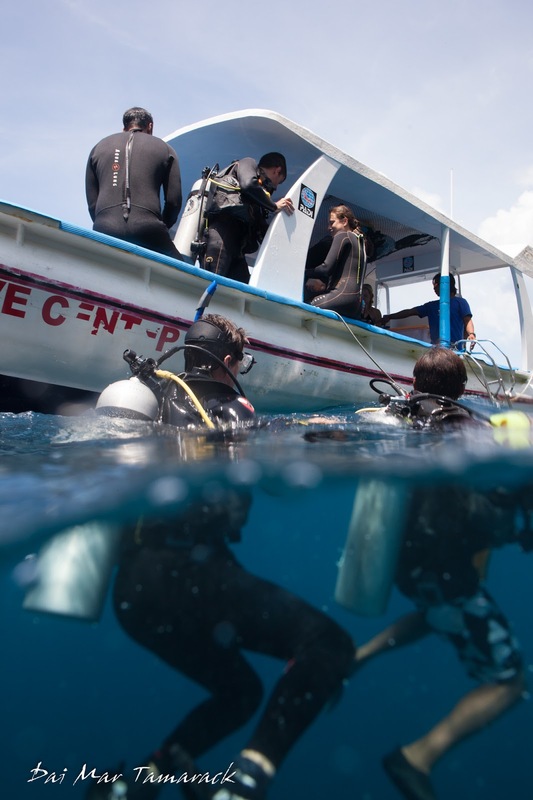 The schedule called for 18 dives over the six day trip, including 2 night dives. 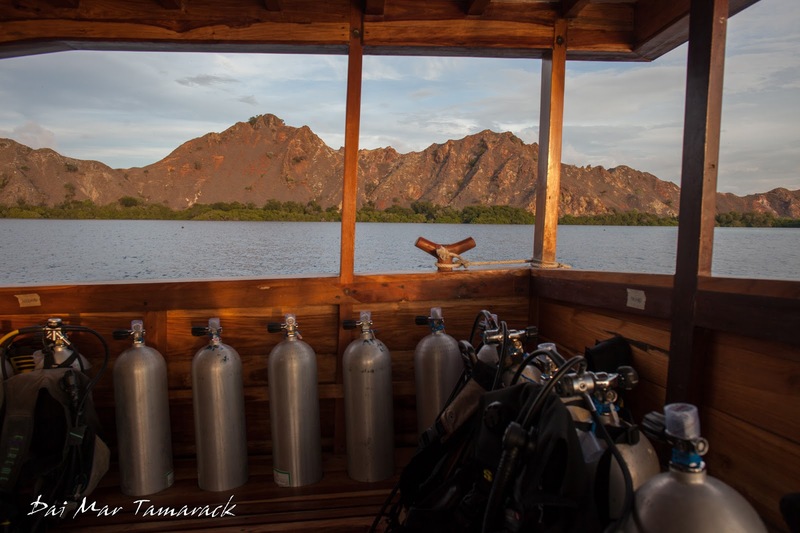 Coffee would be waiting for us in the morning as would Nelwan and Cristina with the first dive briefing. Even though the boat could hold 10 passengers, only 5 had signed up. Heidi and myself, Tim and Marie from Germany, and Mr. Han from a small island in China near Macao. 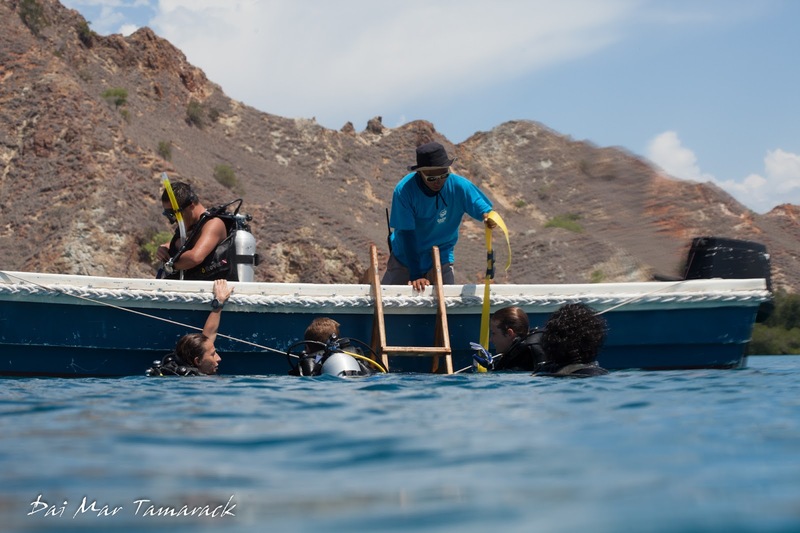 Usually we would load up the small boats and jet off to a nearby dive site, although sometimes we were able to just step right off the back step of Amalia. 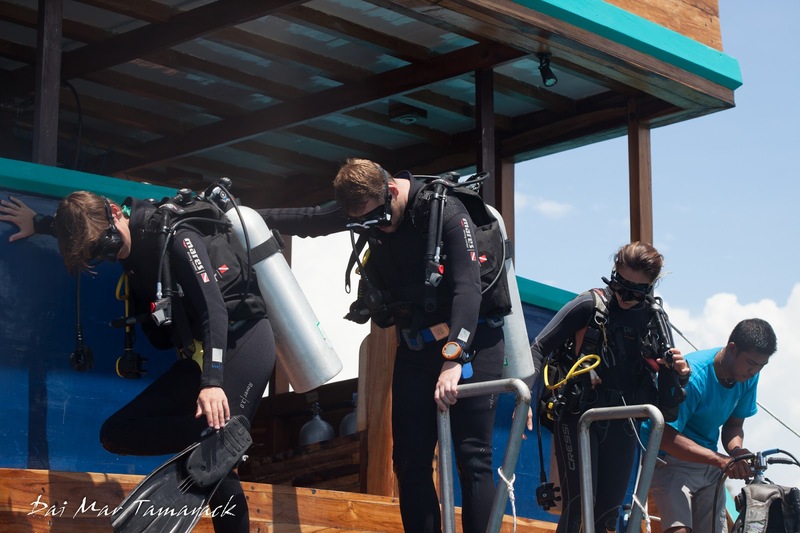 The crew would swarm the back deck to take care of all your gear after the dive and get it switched over to a fresh tank to be ready for the following dive while we would head up to the front where fresh squeezed fruit juice would be there to welcome us back. 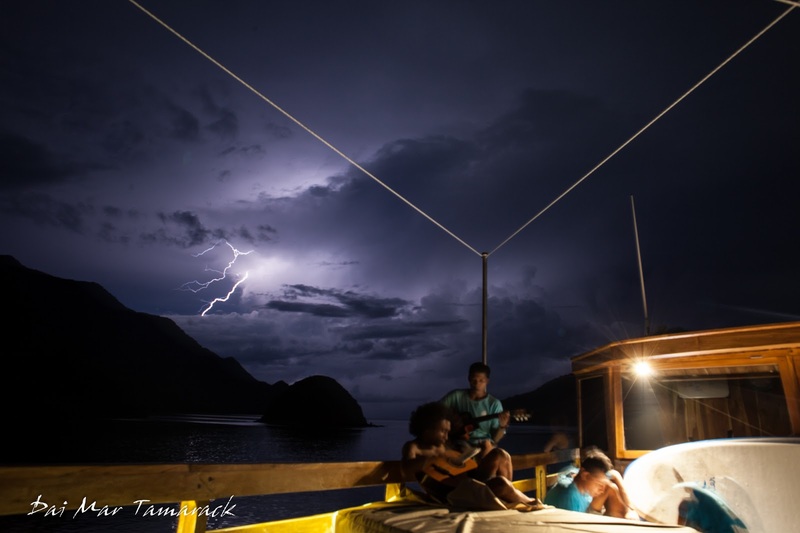 At nights we mixed things up with night dives, sunset hikes, card games, and musical sessions with the talented crew. 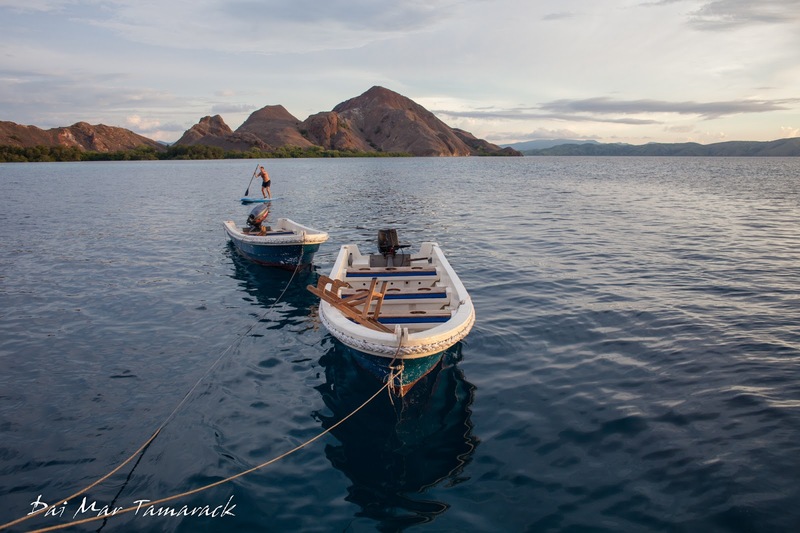 And one of my favorite surprises on the trip was the option of dropping stand up paddle boards into the water during the surface intervals and going for a closer look at the coastline or fringing reef or maybe even a closer look at a komodo dragon hanging out in the surf. 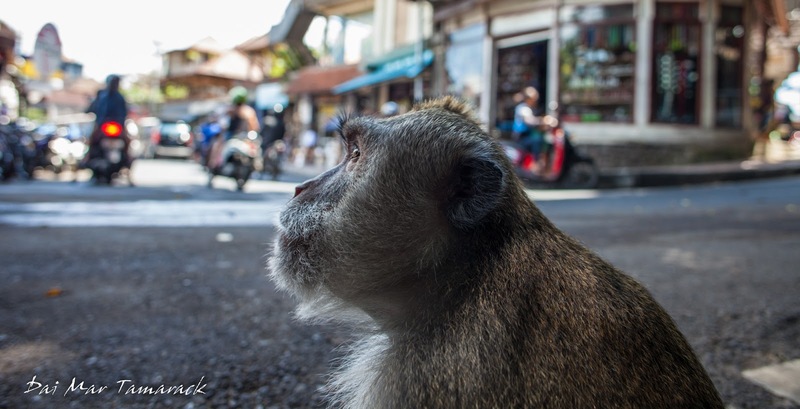 For our last Bali adventure with Ed and Jamie we headed inland for a little culture, beautiful rice terraces, monkeys, good eating, and shopping in the art town of Ubud. Heidi and I had been here back in 2014 and even though it is away from the surf and dive scene we still had a great time. 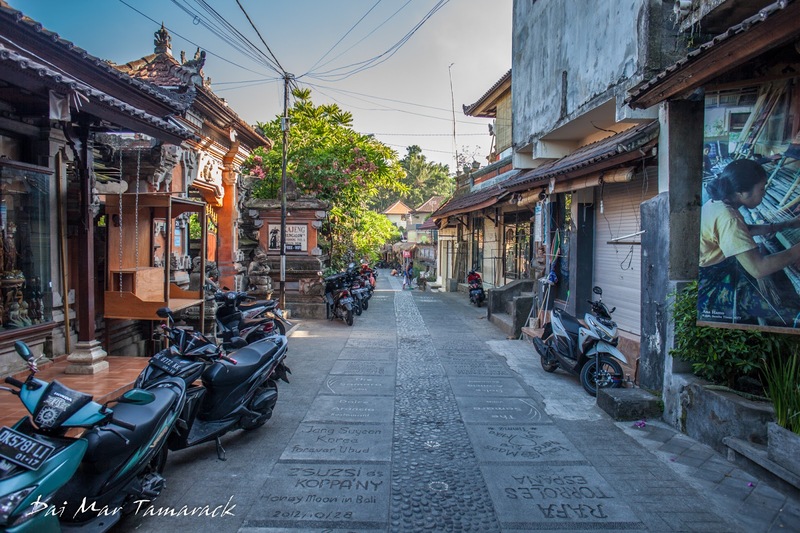 The massages are cheap, think $5 for an hour massage, there is a great walk set up through the many rice terraces that surround the town, and the center of town is a vibrant spot filled with art, shops, shrines, and restaurants. 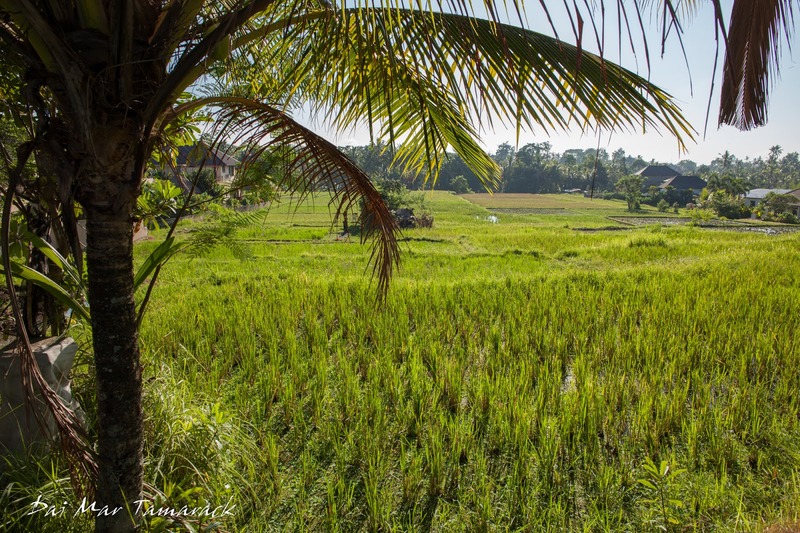 The lack of rain could be seen in a lot of the dry rice fields although there were still a couple places where the fields were lush, green, and picturesque. We saw lots of ducks and skinks in the fields but no snakes like last time. By the time I morning walk was done the sun was beating down hard and hot. 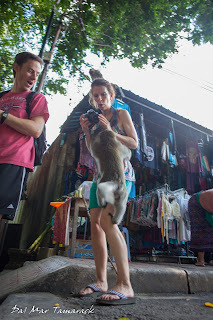 Heidi and I escaped it by heading to the pool while Ed and Jamie continued into the Monkey Forest where they had some very up close encounters with the local resident macaques. Ed tied his backpack zipper shut since the monkeys were trying to unzip it to 'inspect' the contents. 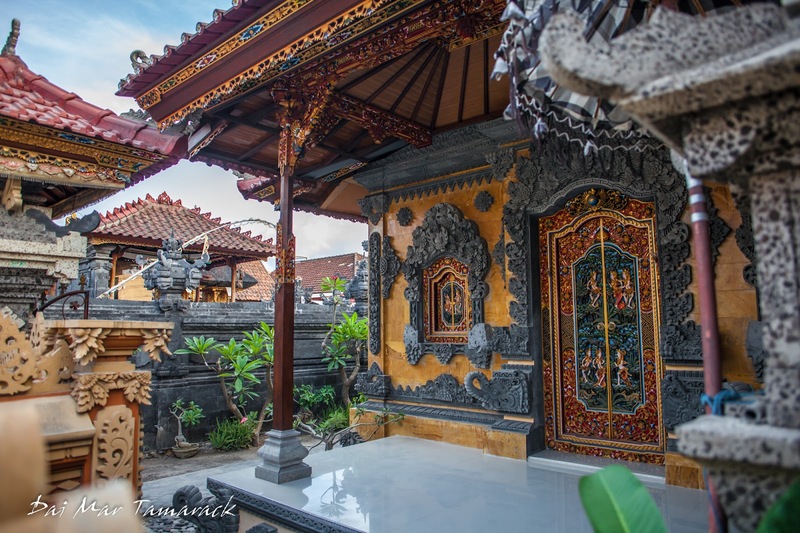 Like most places in Bali every corner is dotted with temples and shrines. I've heard you can find over 20,000 just on this one island. 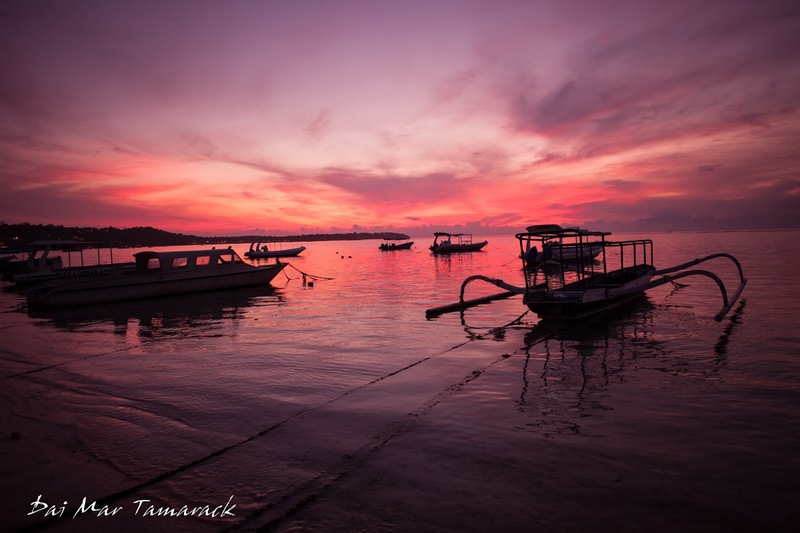 Nusa Lembongan is a small island off the coast of South Bali, only 8 sq km in size. It is connected to an even smaller island of Nusa Cennigan by a rickety bridge just wide enough for one motor bike. This works out nicely here on these slow paced islands because motor bikes are the only traffic, save for a few work trucks. 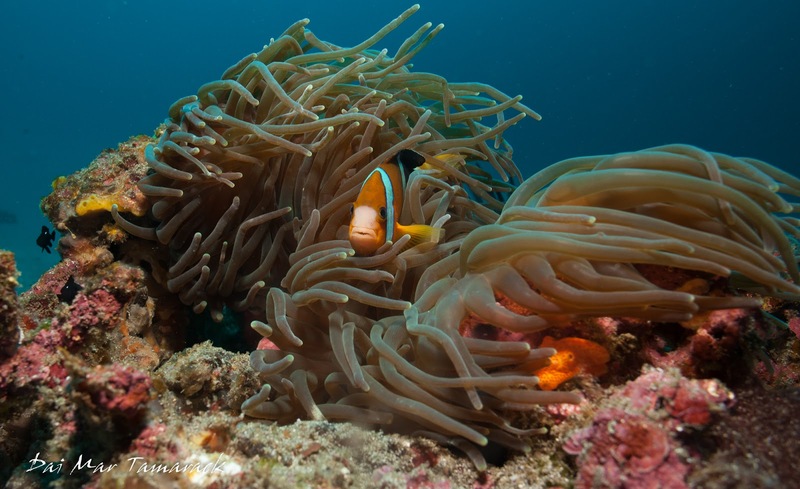 The water is famously clear, so snorkeling and diving are usually the order of the day. However, when the surf is up Nusa Lembongan has some famous waves from the rights of Shipwrecks and Lacerations to the left and Cennigan Point. 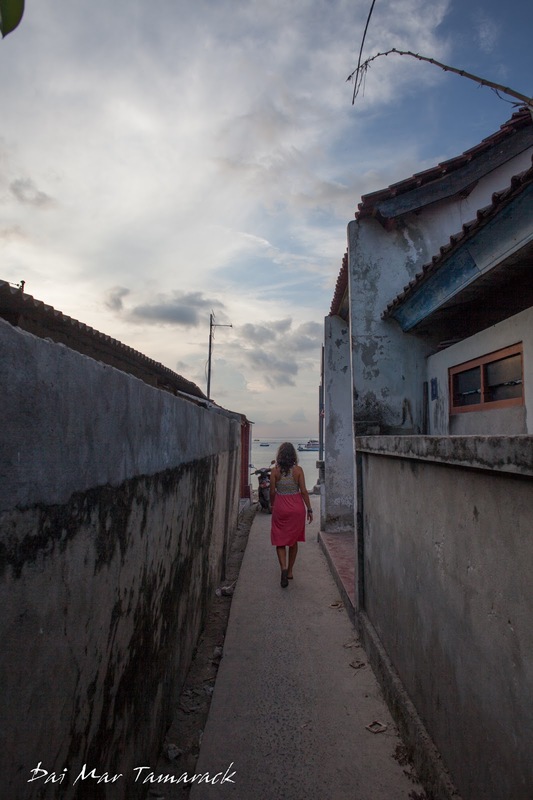 There are few little towns with the largest being Jungut Batu. This is where the ferry from Sanur dropped us off. Rocky Fast Boat ferries run multiple trips daily and jet across the Badung Strait in about half an hour. 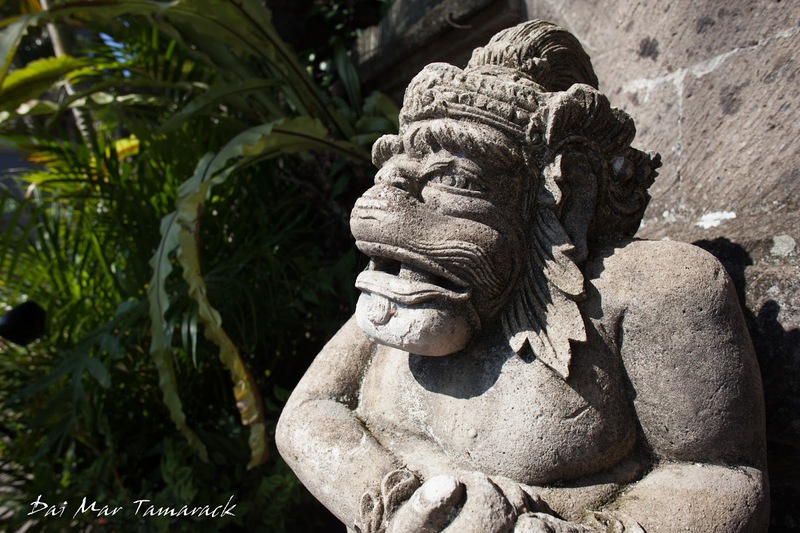 The Hindu culture of Bali continues on Lembongan. There seems to be shrines and temples around every corner. 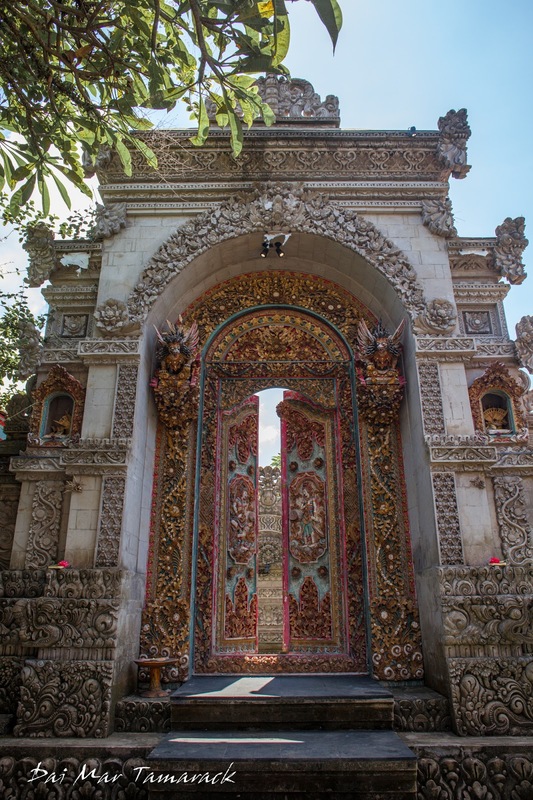 Even then entryway to peoples houses are ornate stone carvings that look like something you would find at a temple. 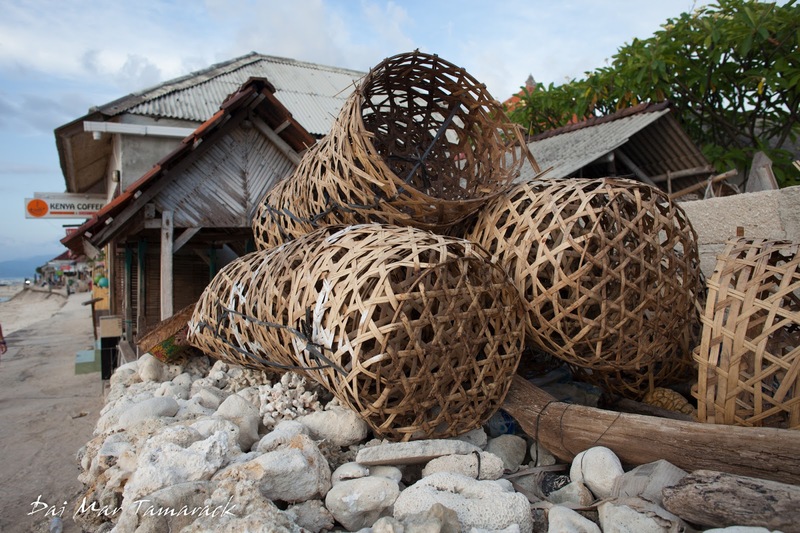 Little woven baskets are filled with offerings every morning and laid to rest in front or on the different shrines. 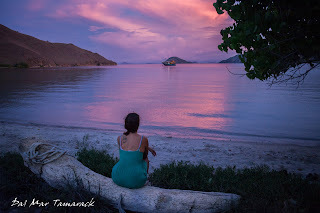 When Heidi and I visited this island four years ago we stumbled upon a little homestay called Widia Homestay where we relaxed for 3 or 4 days. 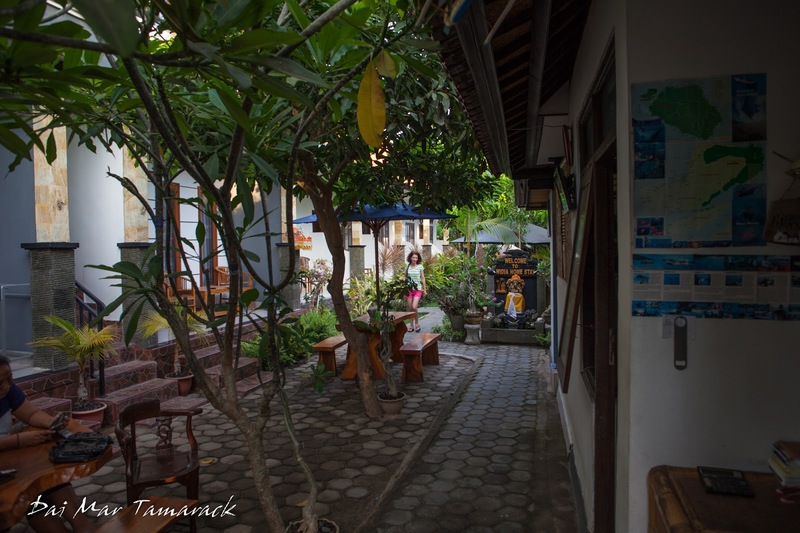 We remembered how nice the owners were, and wondering how they have been doing, we booked out Lembongan stay again with them this time. Not much had changed on the island in the past four years. 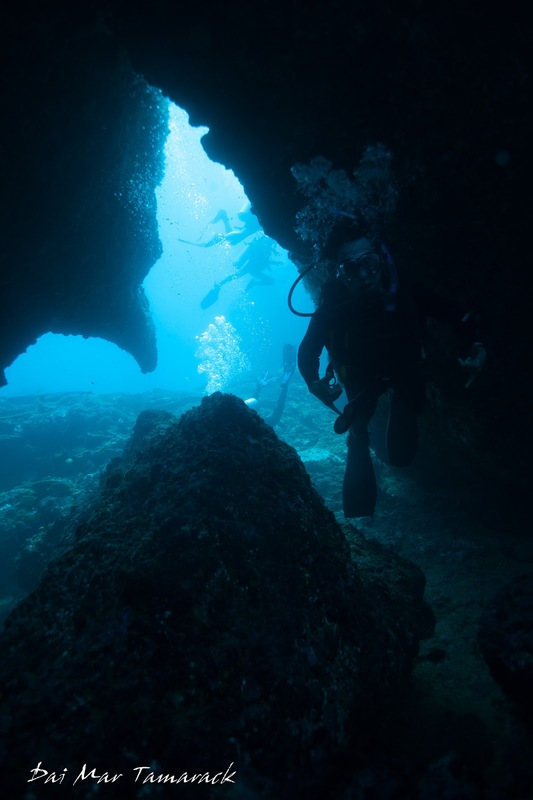 We wanted to get out and explore a little more of the area so diving was on top of our list. We didn't get a chance last time so day one we signed up for a two tank dive trip to manta point and crystal bay. 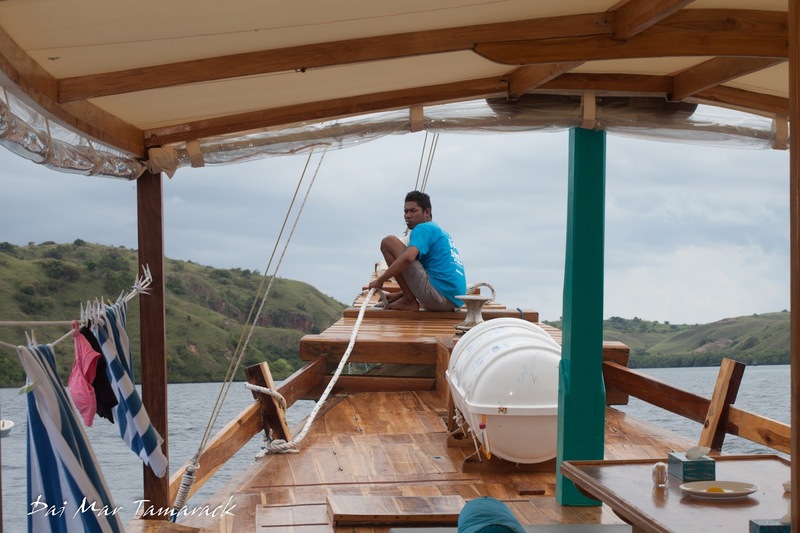 Manta Point is a far boat ride way down the scenic coastline of Nusa Penida, the bigger neighbor to Lembongan and Cennigan. The ride is about 45 minutes during which you pass breathtaking sea cliffs, pinnacles, and even a huge rock arch. Something else we noticed on the ride were the wild convergence zones of strong currents. 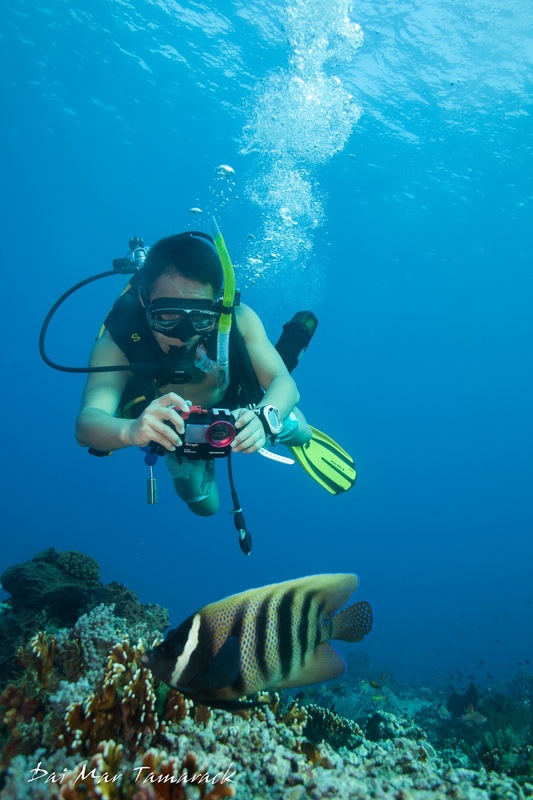 Disturbances on the surface of the water marked areas of upwelling, downcurrents, and other dangers for divers. 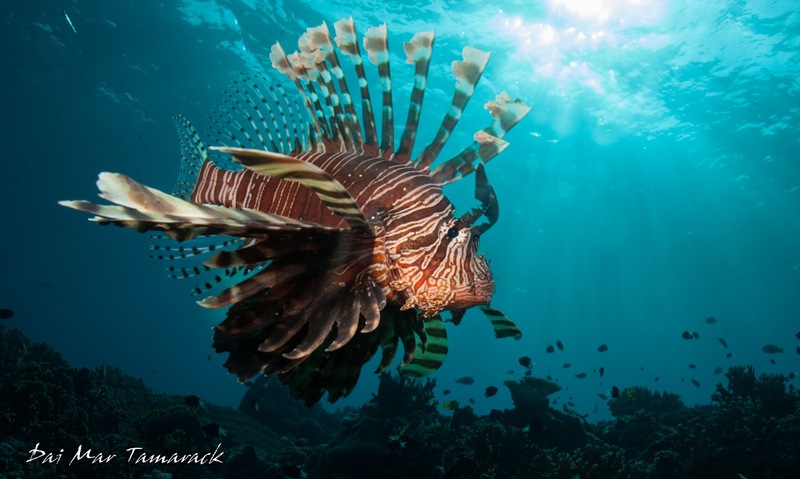 Although, while these strong currents can be difficult for divers, they are exactly what bring in the bigger animals. Sharks, manta rays, dolphins, and big schools of predator fish glide through those currents like they don't have a care in the world, while hunting all the smaller fish brought in by the increased plankton. I had high hopes for seeing mantas since they said the day before they had seen many. 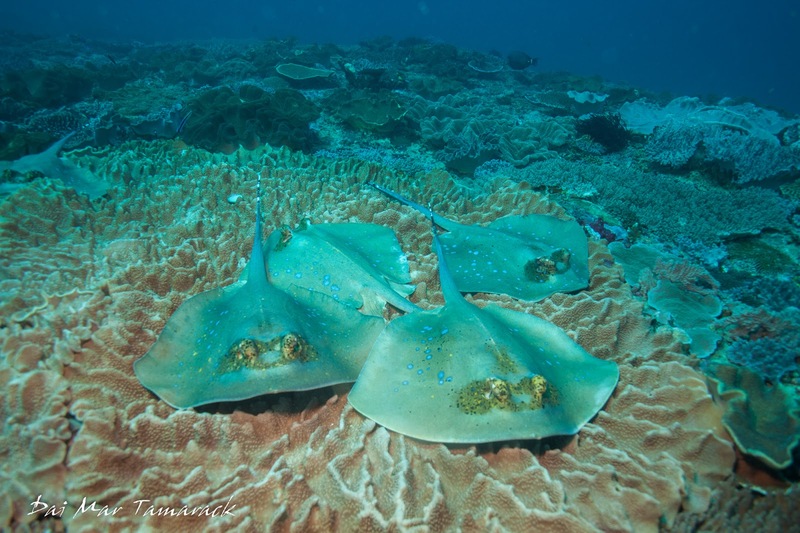 Manta Point has a few cleaning stations where mantas hover over these coral bommies and all the little wrasses and butterfly fish jet out of their hiding places to go clean parasites and dead skin off the manta. Unfortunately no matter how hard we looked we could not find them this day. We did see a new shark species, a bamboo shark, swimming away from one diver giving chase with a GoPro. 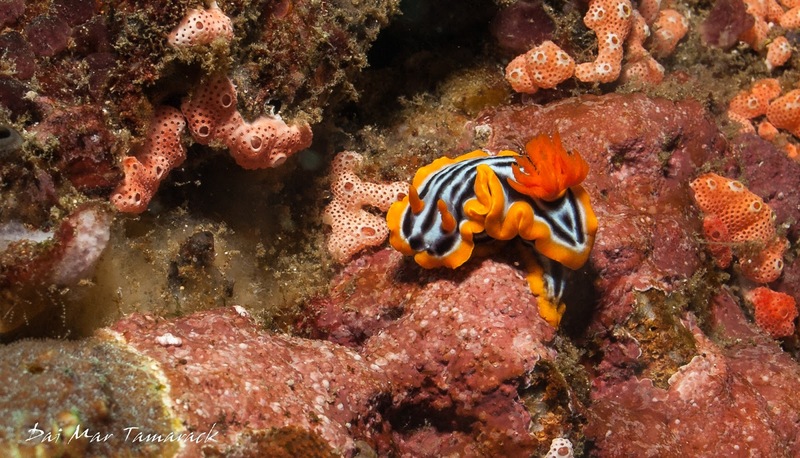 Lots of nudibranchs were around, the water felt great, and one massive table coral acted as a resting spot for five blue spotted stingrays waiting their turns to be cleaned by a small cleaner wrasse. The next spot was Crystal Bay. When we jumped in I noticed it was crystal clear, and also about ten degrees colder than everywhere else. Upwelling from the deep causes this site to consistently be colder, which draws in a very unusual sight, the mola mola, or ocean sunfish. 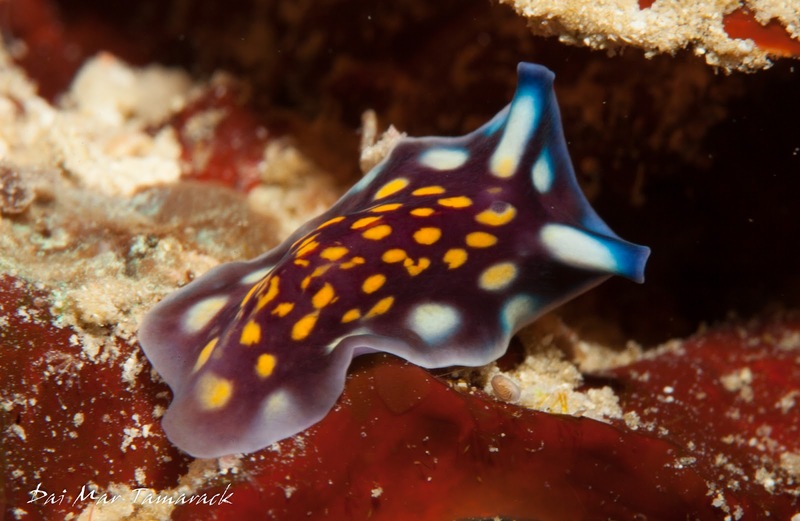 I had some experiences with these weird looking fish during my Catalina/Tole Mour days in California where they would sometimes be sunning at the surface, but I had never seen one while diving. 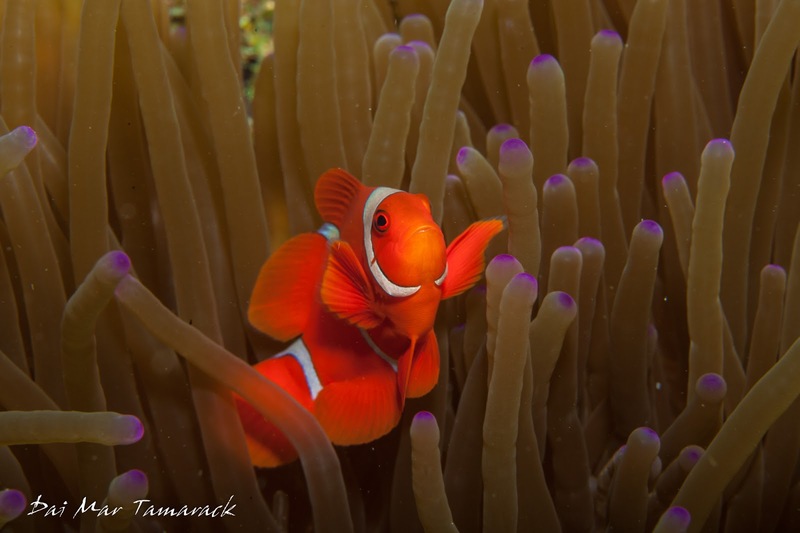 After finding a few crabs, a frogfish, anemonefish, and nudibranchs we heard tank banging from a group behind us hoping to get our attention. We looked out into the blue and there it was, a giant floating head. It was a mola mola! They look like they are missing a tail and are just one giant head, yet they can still become the most massive bony fish on the planet! Back on land Heidi and I decided to explore a bit by motorbike while Ed and Jamie toured Penida. 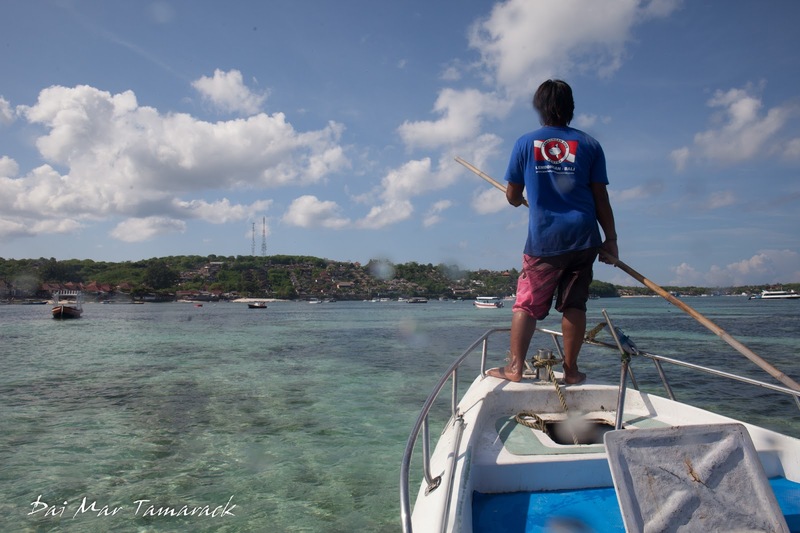 We made our way across Lembongan, then across the nerve wracking narrow bridge to Nusa Cennigan. Our first stop was a beautiful overlook of the thriving seaweed farming industry here. The local farmers create plots of seaweed in the intertidal zones where they string up and grow certain kinds of seaweed that is sold to Asia to make agar and carageenan, popular bonding agents for makeup and cosmetics. From our vantage point we could also see the famous surf break of Cennigan Point, so of course we decided to motorbike over for a closer inspection. Once we got there I saw only a couple of people out surfing what looked like head high lefts, racing past the shallow reef shoreline. I enquired about a board rental and to my surprise I could rent a board right there for only $7. Unfortunately the biggest board he had was 5'11'', which is way smaller than what I normally ride. But not being able to pass up the opportunity, I grabbed the board, jumped in, and paddled out. The paddle out was very easy thanks to a little rip current taking me out. A big group of cliff jumpers would later get caught in the same rip current and need rescuing. I caught a few short ones while I got the hang of the new board. The waves were a little intermittent but then I snagged the wave of the day, ending up way down the line in front of the seaweed farms. 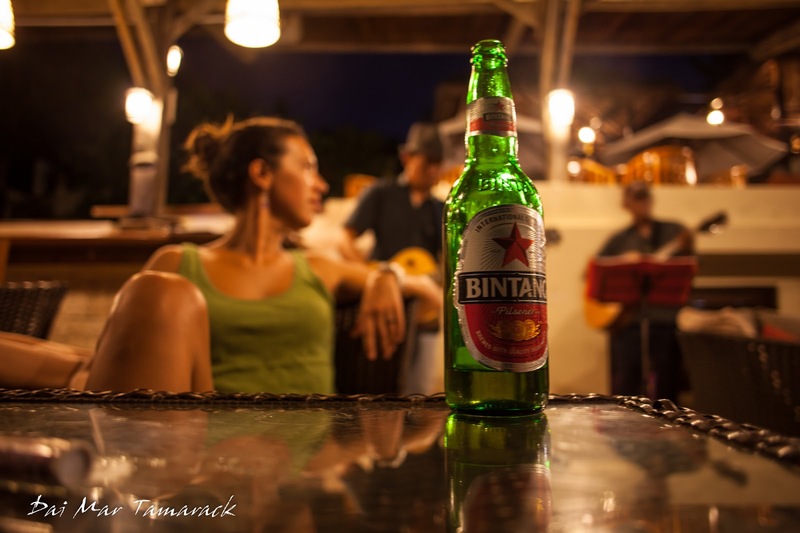 Safely back in town we met back up with Ed and Jamie for another beautiful sunset, cold bintang beer, and even some live music at our dinner table. 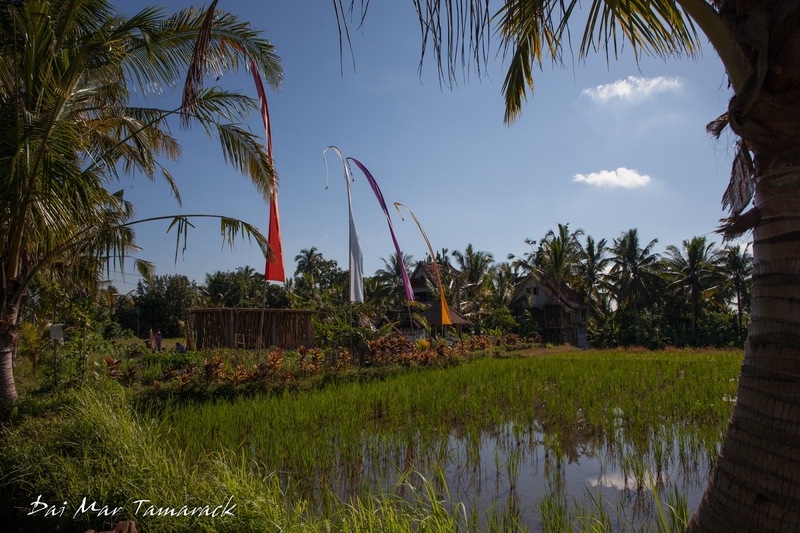 Now its time to switch the activities up for a little more inland adventure as we head to the cultural and art center of Ubud.